Darley's got the Street to itself. In addition to standing Street Cry (IRE) (SRO) at its Kentucky and Australia divisions since 2003, Darley America added that sire's son Street Sense (SRO) to its stallion offerings for 2008. Now another son, Street Boss (pedigree), will join the same roster. (Story on BloodHorse.com.) All Streets lead to Darley, it seems. And it's quite a coup. Street Cry is one of the world's hottest young sires. Currently in the top 10 on the leading sires list by 2008 progeny stakes wins -- and number two by current year grade I stakes winners, trailing only Kingmambo (SRO) -- Street Cry is one of America's few representatives of the Machiavellian branch of the Mr. Prospector sire line. He's proven again and again that he can get a big horse. My TrueNicks colleagues have sounded off recently regarding Street Boss. 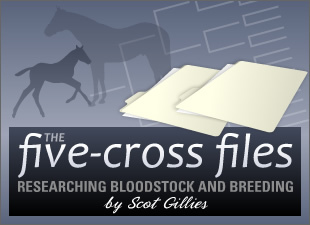 Alan Porter gave a nice review of the colt in a recent pedigree analysis: Street Boss is Rumbling. Byron Rogers looks at Darley's strategy in building the Street Cry "brand" in a TrueNicks blog post published Friday: Owning the Franchise.